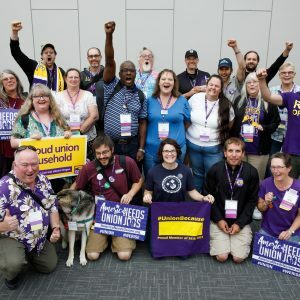 Last year, in a historic effort, SEIU 503 members elected a pro-worker state legislature in Oregon. The legislature convenes today in Salem, and it’s time to deliver on promises that will improve our lives, strengthen our communities, and protect our right to stick together in union. We have a unique opportunity this year to address decades of underfunding in Oregon’s schools, healthcare, and public services — while creating the budget environment we need to bargain strong contracts. It’s finally time. Oregon consistently ranks among the states with the lowest corporate taxes in the nation. As a result, our public systems have fallen behind and SEIU members have seen contract after contract deliver only modest gains. Previous efforts to address these problems have fallen short, but with some large businesses coming to the table, real change is within reach. Major hurdles still stand in our way. Intense lobbying from big corporations has derailed previous attempts to raise corporate taxes, often by scapegoating public employee benefits. We’re hopeful that the new pro-worker Legislature has the votes to overcome this challenge. But even if they do, any revenue legislation will likely be referred to the ballot, where it will have to be approved by voters. SEIU members and our partners in the community are getting organized because this will be a long, hard fight. Together we have the strength to win. 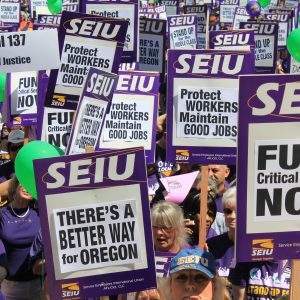 Every SEIU member is impacted by the funding set for state agencies, whether it’s the Child Welfare budget at DHS or the funding for homecare or the salary pot available for ODOT workers. Our union is organizing lobby days and recruiting members to testify at hearings to ensure state agencies are adequately funded, and that the funding is used to address real problems that we see every day. 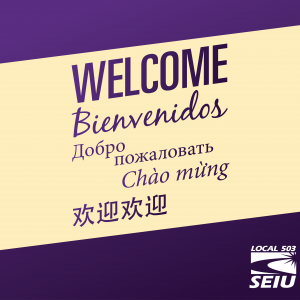 SEIU 503 members have been pushing our state’s leaders to do something about affordable housing for years. Why? Because a raise doesn’t mean much when your rent goes up 15 or 20 or 30 percent. This year, we will fight for groundbreaking legislation to prevent outrageous rent hikes and end no-cause evictions. This is a bill will help our union continue to defend workplace rights of Oregon’s public workers. Homecare, personal support, nursing homes, adult foster homes, and other caregiving jobs are among the most important and least supported jobs in Oregon. It is time to change that. SEIU members are pushing a package of reforms we call The Care Agenda that will make significant improvements to this system. Our priorities are to make caregiving jobs good jobs, to ensure that seniors and people with disabilities receive high-quality services, and to expand people’s right to live independently in their communities if they choose, not locked away in an institution. Governor Brown has put higher education funding right in the center of the upcoming fight for new revenue, by making needed funding part of an “investment” budget that’s tied to new corporate taxes. As a result, universities are once again at real risk of cuts. We need to get organized and get ready for a fight both in the legislature and at the bargaining table, because our higher education system and the thousands of good, union jobs it supports are vital to building a better Oregon. Medicaid funding and the provider tax, which was what we successfully defended on the ballot through Measure 101, needs to be renewed in 2019. This funding package is key to providing affordable health care to Oregon families, including many of our members. This session will consider numerous policies around prescription drug costs and transparencies, hospital costs and many other issues on health care that will impact our members’ health care. We will continue to defend our members’ benefits and we know that this is going to be an ongoing issue in the Legislature. In addition, we are working on a bill to repeal double coverage and a technical fix PERS bill for Oregon State Hospital members. Through the Fair Shot coalition, SEIU members have raised the minimum wage, created the Oregon Saves retirement plan, won paid sick days, and secured healthcare for every kid in the state. This year, the coalition will work to increase funding for public services, address affordable housing, win paid family and medical leave, improve economic opportunities for immigrants, and reform our inadequate public defender system.